I love a little flirtation in the garden. Yesterday, my cape primrose ‘Black Panther’ reminded me of just how much fun it is to be teased and surprised. I was dutifully weeding the Secret Garden path when I noticed something dark and mysterious peeking out from between the Streptocarpus leaves. Earlier this summer, I placed this tropical houseplant in a glazed pot and set it out on the chair beside my door. All sumer long, in spite of my potash rich fertilizer, ‘Black Panther’ has been reluctant to bloom. I blamed this shyness on the cool, rainy weather and resigned myself to his indifference. Imagine my surprise when I saw that violet shadow on the other side of the foliage. I quickly spun the pot around to have a better look. And there he was, that sneaky devil! Gorgeous. Just look at that deep, dark velvety beauty. Can you believe that color? Some things are so worth waiting for. 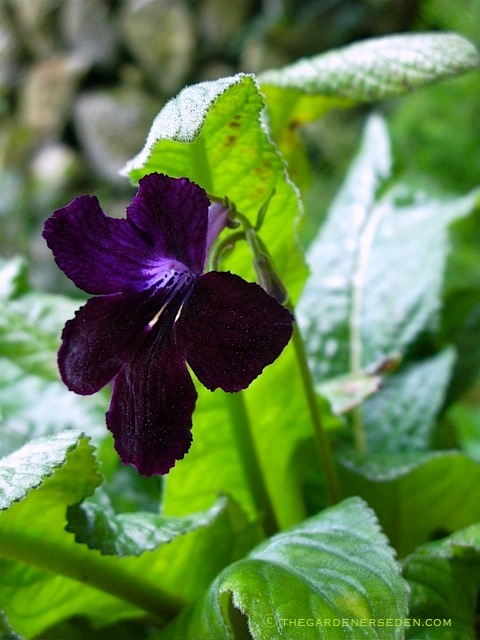 Cape primrose ‘Black Panther’ belongs to the genus Streptocarpus, a rather large group of annual and perennial tropical plants containing more than 100 species. Streptocarpus come from the rain forest originally, growing on rocks and along banks in moist, humid forests and tropical rivers. This exotic plant can be found growing wild in China and South East Asia, southern Africa and Madagascar. But here in North America, Cape primrose is a conservatory plant; preferring warm, humid conditions and steady filtered light. I bring the ‘Black Panther’ inside each winter and I reduce watering a bit. As soon as outside temperatures moderate in early summer, I water the pot deeply and fertilize, placing it outside in my protected Secret Garden where he receives low-light, filtered by the steel balcony above. I am so enamored with this mysterious, solitary blossom… And of course I am greedy for more. Will he spoil me, now that he is in the mood ? I can only wait and see. Anticipation… It can be so delightful. § 7 Responses to Hello Lover…"
I just discovered your site. I love it!!! I have been growing several colors of Streptocarpus in my home for for about a decade now, but have never thought of putting them out in the garden during the summer. What a great idea. You are currently reading Hello Lover… at The Gardener's Eden.